Following on the heels of the televised health care summit, President Obama has met with several House Democrats this week and called for an “up-or-down vote” on health care reform in his speech on Wednesday. This is code for suggesting a reconciliation bill, which cannot be filibustered and requires only a simple majority of 51 votes to pass in the Senate. Reports indicate that Obama has urged the House to vote on the Senate’s bill by March 18, but House Democratic leaders have expressed that the end of March may be more realistic. 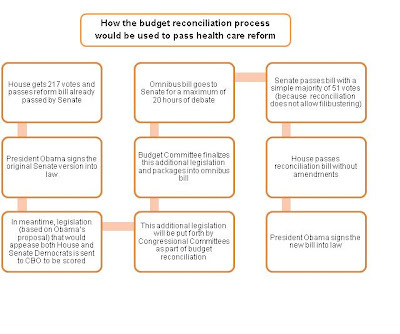 Additional legislation—including lower penalties on the individual mandate, higher subsidies for low-income Americans, increased benefits for Medicare prescription drug beneficiaries, and the removal of special Medicaid funding for Nebraska—is already being sent to the Congressional Budget Office to be scored for inclusion during the reconciliation process. While House Speaker Nancy Pelosi believes that House Democrats will be reassured by these measures, the inclusion of federal funding for abortion in the Senate bill is still a sticking point for nearly a dozen pro-life Democrats. Stricter abortion language will be difficult to adopt through reconciliation as the process is intended for budget-related issues only. Wow! Thanks for keeping us informed.